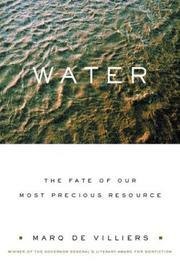 A well-researched, fluent summary of the political and biological state of our global water resources, from Canadian author de Villiers (The Heartbreak Grape, 1993, etc.). The problem is not so much that there isn’t enough water, explains the author, although growing populations may put that to the test. It is that water isn’t where we want it: too much in the north when we need it in the south; too much seawater when we want freshwater; too much locked up in glaciers when we need it in our highballs or our sprinklers. So we go forth and fight for it, or steal it, or finagle it, or hold back what once flowed by. Twain had it right: “Whiskey is for drinkin’; water is for fightin’.” Not that we have treated the water we do have access to with any sort of decency. De Villiers brings a sympathetic regard to the troubled waterscape, from the shrunken befouled Aral Sea to the waterway robbery of the Colorado River to cockamamie schemes from the Soviet bureaucracy to divert the great Arctic rivers. He details the downsides (or at least the overbalancing of cons to pros) of dams, irrigation, and tapping into aquifers—including salinization, siltation, habitat destruction, and microclimate changes. Numerous examples are given up to buttress points that are well-made—of the ripple effects of tinkering with natural systems, for instance—if not earthshaking in their novelty. The value of this book is in giving readers perspective: where mistakes have been made and where thorny water issues are likely to raise their heads in the future. On the other hand, de Villiers’s chapter on “solutions” is a blend of wishful thinking (technological answers and population decline) and doomsaying (water wars). Written with grace and an eye for captivating material, making this catalog of water misuses (past, present, and future) all the more poignant.